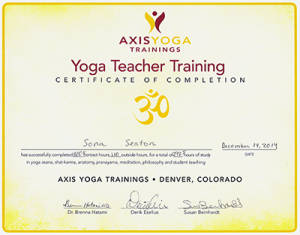 Sona Seaton is a Certified Yoga Teacher through AXIS YOGA TRAINING in Denver, Colorado. She completed her training on December 14, 2014. This intensive 200 hour course of study included yoga asana, shat-karma, anatomy, pranayama, meditation, philosophy and student teaching. Overall, the process of the training, and yoga itself, can have a very beneficial effect on the graduates’ work, spiritual, social and family life.